Ian Bishop made a huge impression on Cherries fans despite spending only one season at the club. afcb.co.uk looks back on seven players who enjoyed short and sweet success with the club. While Eddie Howe was this week awarded the freedom of the borough, ex-AFC Bournemouth star Ian Bishop always felt he had been given the freedom of Dean Court. Bishop’s stay may have been short but it was certainly sweet, the gifted playmaker still revered by supporters who watched him in the late 1980s. A bargain £35,000 buy from Carlisle in July 1988, he became a huge terrace favourite as the Cherries achieved a then club-record finishing position in the second tier. He missed just two games in a marathon 56-match season as Harry Redknapp’s men came 12th and took Manchester United to an FA Cup fifth-round replay. Recalling his one season with the Cherries, Bishop, who now lives in Florida, told afcb.co.uk: “I enjoyed the freedom I was given by Harry. “He used to say to me ‘Bish, just go out and do your stuff’. There were no particular orders or rules for me. “Harry resurrected my career and that’s what that season did for me. It put me back in the window. “I can look back on my career and say I was grateful for this and that but I will always be eternally grateful to Harry for giving me the chance to play on that stage. “For it to only be one season and the sadness I felt when I had to leave showed what the club had done for me and the affection I had for the club. “I just enjoyed playing football in a footballing team. The way we played was similar to the way they play today. I was that type of player and loved every minute of my time at Bournemouth,” added Bishop, who is pictured above with Cherries fan Dave Cordell. Joined the Cherries for £22,500 from Tranmere Rovers and scored 35 goals in 56 games, finishing the campaign as the club's leading goalscorer. Went on to play in the 1986 World Cup for Northern Ireland before being sold to Southampton for £400,000 in July 1986. Clarke returned to Dean Court for a four-game loan spell in December 1988 before playing for QPR and Portsmouth. Signed on loan from West Ham, the teenage striker plundered 19 goals in 31 games – including scoring in 10 Division Two matches in a row – as the Cherries narrowly missed out on the play-offs. The frontman returned to the club on a permanent transfer in June 2017 and scored crucial goals against Crystal Palace, Brighton and Watford as the Cherries secured a fourth successive season in the Premier League. Moved to Dean Court in a £35,000 deal from Wigan and established himself as a firm favourite during his brief stay before signing for Everton for £800,000 in March 1994. He went on to win the FA Cup with the Toffees in 1995 before being forced to retire at 28 due to a persistent knee injury. The Northern Ireland international striker joined the Cherries for £40,000 from West Ham and scored 24 goals in 54 games before signing for Reading for £55,000. In management, Quinn took Reading to the brink of the Premier League in 1995 and guided Shrewsbury back into the Football League in 2004. He returned to Dean Court to briefly manage the club in 2008. One of the highest-profile signings in the club’s history, the midfielder penned a season-long loan deal from Arsenal and made 27 appearances as the Cherries secured ninth, their best finishing position in the Premier League. Capped 34 times by England, Wilshere won successive player-of-the-month awards in November and December 2016 before his loan spell was cut short after he sustained a broken leg during a collision with Tottenham's Harry Kane at White Hart Lane. The French central defender earned hero status after scoring in both legs of the Auto Windscreens Shield area final against Walsall as the Cherries booked a place at Wembley for the first time in their history. 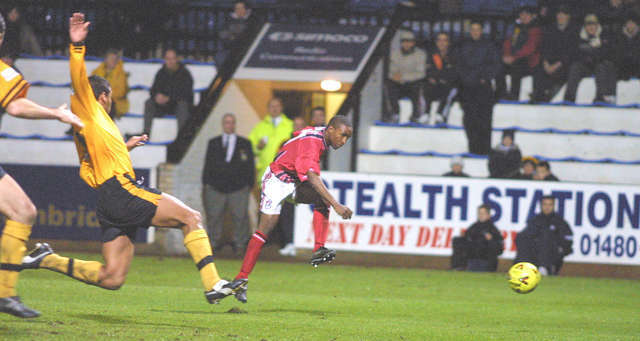 He also netted the only goal against Luton in the previous round and scored four times in 30 league appearances but was an unused substitute in the Auto Windscreens Shield final against Grimsby. The full interview with Ian Bishop will feature in the Newcastle United edition of Matchday, which is priced at £3.50 and available around the ground ahead of kick-off. The magazine will also be available to purchase online at superstore.afcb.co.uk.